In terms of the history of Australian fences, post-and-rail fences continued to dominate the times, but as timber became increasingly expensive, wire fences became a more competitively priced replacement for timber rails – although rails did continue to be used for containing large numbers of horned cattle. The first wire fencing material was known as ‘black wire’, and it was nearly 6mm thick because it had a lower strength in terms of breaking under tension compared to modern steel wire. In 1862, The Australian Builders’ Price Book featured mesh wire for fencing that was from a half an inch to 3 inches which was available in rolls of 300 to 1220mm in width. By the 1880’s there were ten wire works in Victoria and wire became one of the largest iron and steel imports. The first reference to galvanized wire netting fences in Australia appeared in 1888 in the form of an ad for the Iron Wire, Rope & Fencing Company on the front of the industry publication, the JWF Rodgers Australian Federal Directory. It featured an illustration of chicken wire, which was described as ‘superior galvanised steel netting for sheep, kangaroos and rabbits’ which featured a ‘patent designed brace’. These continued to be built but were becoming much less common during this period. In a two-rail fence, one strand of wire ran between the rails. Depending on the size of the stock to be contained, other strands of wire may have been included as well. Patent fencing materials were first imported into Australia from England by D. Ravell & Co in 1888. The fence consisted of four wire strands that were equally strained and spaced between timber posts. Chicken wire netting was used to clad the lower half, and the upper two strands were of patent barbed wire. This type of fencing was used to contain rabbits and sheep, and was claimed to also keep out kangaroos. No surviving examples of this type of fence are known to exist. From 1870 to 1900 decorative cast iron designs were required to be registered, and during this time there were 161 designs registered by 33 manufacturers. Between 1884 and 1892 the most prolific of the manufacturers was Angus McClean who registered 48 designs. The Australian Ironmonger publication of 1888 described Cochrane & Scott’s exhibit at the Centennial International Exhibition Melbourne as including ‘cast-iron gate pillars for both wicket and carriage gates in both solid and open patterns’. This manufacturer’s ironwork was elaborately printed, and the designs were in a variety of colours. Walter & Grey of Melbourne included in their exhibit a ‘pair of massive cast-iron gate pillars of a new pattern and suitable for a pair of carriage gates’. Apart from timber picket fences in Australia, cast-iron palisade fences became popular in urban Victoria in this period, and strong posts were necessary to carry the weight of heavy cast-iron gates. These were usually hollow, large and square. On each face, floral and geometrical patterns were arranged above and below a small rosette or most commonly, a lion’s mask and occasionally a female head. The spearheads on the railings were usually tri-radiated and a fleur-de-lis pattern was common. After about 1860, railings were commonly of rolled steel rod, and rails were of steel bar. The catalogue of the Excelsior Foundry in around 1901 shows a fence with one post, nine post caps, seven railing spearheads, one common gate and an elaborate wicket gate. In South Australia, the characteristic cast iron fence was erected over a higher stone plinth that accounted for a third to a half the height of the fence. The castings were more frequently decorative panels rather than a repetitive palisade of spearheads, and gateposts were generally solid rather than constructed from panels. After 1860 in Melbourne, railings were commonly made of plain, rolled steel screwed into cast-iron spearheads. 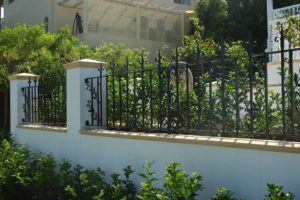 Fence and gate posts generally consisted of four side panels of decorative cast ironwork which were bolted or screwed together with metal lug attachments. Decorative patterns were arranged above and below a central motif on each face – usually a female head, rosette or a lion’s mask. The posts were topped by one of several patterns of post caps. Palisades were normally single or double and railings were set into drill holes in a bluestone plinth that was filled with molten lead. This was to achieve a secure fit for the penetrated holes in the middle and top rails of rolled steel bar. The rails were riveted to the gateposts and railings then penetrated circular holes drilled into the rails. Gates were similarly manufactured with a more substantial rolled steel bar frame and bottom rails. The side rails were capped with cast-iron finials, which were larger than the intervening spearheads. Gates generally had a lock or latch above the middle rail and round-headed gates were also manufactured. Examples of these fences can still be seen today in some of Melbourne’s inner-ring suburbs, including in Carlton, Fitzroy, Hawthorn, Richmond, Parkville, North Melbourne, East Melbourne, St Kilda, South Yarra and South Melbourne. One of the other more common types of Australian fences during this period, these were made by setting rails between posts over a plinth and pickets were fixed with two nails to each rail. Posts were capped with cast-iron capping pieces or with a cast-lead rosette. Picket fences were generally painted and made from pieces of timber like cedar or pine, which were oiled and varnished. Today these can be seen in Prahran, Port Melbourne, Brunswick, Ascot Vale, Northcote, Prahran and Collingwood. In terms of construction, galvanized iron sheets were fixed vertically to two or three rails, generally over a bevelled timber plinth. They also often had gable moulded capping added. These can be seen today in number of Melbourne inner-ring suburbs including at Parliament House. Still visible in the Melbourne suburb of Brunswick, these were fashioned from dense privet, pittosporum, box or melaleuca plants grown in a hedge behind a picket or a palisade fence if a visual or sound or barrier was needed. The fence was maintained regularly in a rectangular shape normally the same height as the fence itself. Keen to replicate some of the features of fences back in the 19th century? Contact the experts at Dean-Wilson Iron on 3814 0076. National Trust. Fences & Gates.